A kingdom is small in area. An empire is large in area. Needs a small army to protect its territory. Needs a much larger army to protect its territory. Needs a small number of officials to collect taxes. Needs a large number of officials to collect taxes. The king has direct control over the whole territory. The emperor rules with the help of local governors. The Mauryan Empire was founded by Changragupta Maurya. It was founded about 2300 years ago. It continued from 322 BC to 185 BC. A Brahmin; named Chanakya; helped Chandragupta in getting to rule over the Mauryan Empire. Chanakya proposed many innovative ideas about politics and governance. His ideas were written down in a book called Arthashastra. Initially, the Mauryan Empire began from the Magadha. Later, it expanded to different parts of India. It was the largest empire of its time. It was also the largest empire ever in the history of India. Successors of Chandragupta: Chandragupta’s son Bimbisara succeeded him. Similarly, Bimbisara’s son Ashoka succeeded him. Chandragupta, Bimbisara and Ashoka were the greatest rulers of the Mauryan Empire. 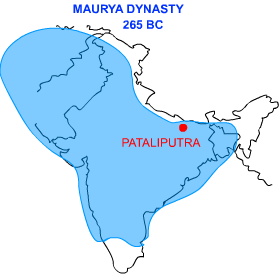 Capital City: Pataliputra was the capital city of the Mauryan Empire. This is now known as Patna. Many other important cities; like Taxila, Ujjain and Mathura were under this Empire. These were important centres of trade. The cities were mainly inhabited by traders. Famers and herders lived in villages. Hunters and gatherers lived in the forests of central India. The Empire was so large that people in different areas spoke different languages.